If you love bacon, then you ought to be careful about getting a bite from a lone star tick — unlike other tick bites, which can spread diseases like Lyme disease, a lone star tick bite can actually make you allergic to red meat. A single bite from a lone star tick can significantly raise antibodies to alpha-gal, a sugar carbohydrate found in beef, pork and lamb, and the elevated antibodies cause a meat allergy. This alpha-gal allergy is only found in people bitten by the lone star tick, though researchers are uncertain what in the bite is triggering the response. Symptoms can include hives, vomiting, asthma, headache, and in extreme cases, anaphylactic shock, leading to death. Stanley Fineman, an allergist and president of American College of Allergy, Asthma and Immunology (ACAAI) says, "It takes 4-to-6 hours to see a reaction, so many people don't correlate that to their meat, or hamburger or something. It's easy to miss." There is a 32% higher chance of contracting the allergy and subsequent forced vegetarianism among those living in central or southern portions of the United States — but don't breathe a sigh of relief if you live outside the area. According to the CDC, which is tracking the tick for spreading southern tick-associated rash illness (STARI), the range and number of ticks has been increasing and large numbers have been found as far north as Maine and as far west as central Texas and Oklahoma. 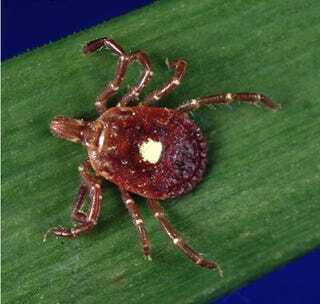 The lone star tick is particularly nasty and aggressive, biting even in the larval stage, unlike other ticks. The only way to avoid the allergy is to avoid being bitten by the tick. The CDC recommends staying out of their habitat of dense woods and brushy areas, using insect repellents containing DEET or permethrin, wearing long pants and socks, and performing tick checks and promptly removing ticks after outdoor activity. Always monitor your health after a tick bite. Many of the other tick-borne diseases have similar symptoms to the alpha-gal allergy. But it isn't all bad news for you bacon lovers — there is some evidence that if a person is not continually bitten, the allergy might go away with time. Another good reason to stay indoors.